I just can’t resist this movie. I canNOT deny myself watching it. Whether it be on TV mid-Saturday when I should be starting my giant Psych paper due Monday or on the bottom of the list of PVR’d movies while babysitting for a friend. 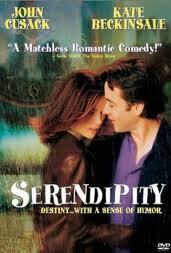 There could be 15 movies I’ve seen – or not seen – sitting in a pile and Serendipity would be the one I’d want to watch. Today, I dissect the wonderfulness of this movie. It’s like they’re real people! Don’t get me wrong, I LOVE watching movies full of unreasonably beautiful people like Ryan Gosling and Rachel McAdams (not necessarily at the same time), but there’s also something relatable about watching a movie with realistically attractive people that you might see walking down the street. John Cusak has something about him that you just have to love, yet also looks so average. Kate Beckinsale can be knock-out gorgeous, but she’s just a regularly pretty girl here. Jeremy Piven and Molly Shannon? Perfect comic relief as the best friends. It doesn’t hurt that the fiance and fiancee are just portrayed as “meh” or downright nutty. Thumbs up so far. Also, the kid in the elevator dressed as a devil that hisses sporadically and Eugene Levy are giggle-worthy. The background music is always…not simple. Not basic…what is the word I am looking for? Just one instrument (or complex enough to sound like it’s just one simple guitar or piano). The same riff plays at all the right moments, it carries the hidden feelings throughout the story. Ooo, Ooo! I found it! January Rain by David Gray. And the other one, Black Eyed Dog by Nick Drake. This is like the best moment of my LIFE! Ok, maybe not the best. But anything involving finding ‘that’ music is pretty noteworthy. Thank you, internet! It’s winter. Snow falls. Lights twinkle. Need I say more? “If you want to improve, be content to be thought foolish and stupid.” – Dean quoting a philosopher. Basically the whole plane speech by Jeremy Piven’s character is pretty stellar. “Maybe we’re lying here because you don’t wanna be standing somewhere else.” – Dean to Jon when it’s all falling apart. So deep. “You know the Greeks didn’t write obituaries. They only asked one question after a man died: ‘Did he have passion? '” – Dean to Jonathan at the seeming end of the search. “How do I look?” / “Like an jackass.” – Ahh…just watch it. The last one, I can’t actually include here… it’s too great IN the movie. Watch it. Right now. – the “obituary” that Jon’s best friend writes for him. These quotes are just gobbeldy-gook without the music, story, characters speaking them to you in context. Seriously, go watch it now. “Old Spice” – watch it. You’ll know. Molly Shannon and her casanova candle customer. Everyone – whether openly or not – loves Sara and Jon’s bravery to search for their own happiness. Not many people risk that. Too many settle. Who says you can’t turn your life into a Disney princess fairytale? Or in your quest for it, learn something about yourself, what you want in life, and that you CAN get it. That it’s worth doing what’s necessary to be happy in your life – even if it sometimes hurts you and those around you. Because ultimately, if you’re not happy, the people in your life won’t be able to be as happy as they could be either. Sometimes the best thing you can do for someone else is to say goodbye. I think I like this movie better when I’m single. It’s almost about that. Being okay with NOT settling with a relationship just because you have one. Having strength to walk away if it’s the right thing. For yourself, not for anyone else. Okay, I totally shouldn’t admit this (I’ve got a tough girl reputation to uphold!) but I actually like this movie. I think John Cusack is so endearing in pretty much anything he’s in. Seriously, John Cusack is the best!